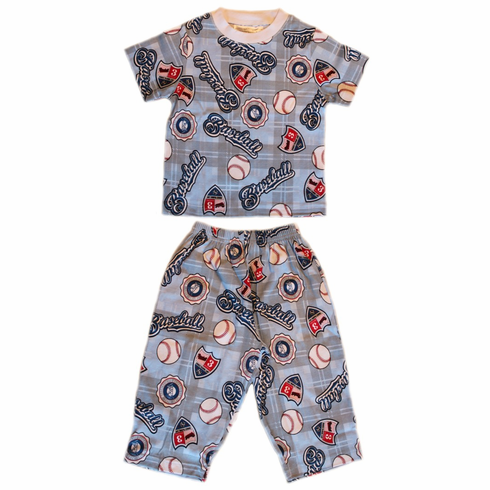 These Summer Baseball Camp baseball youth pajamas are 100% compacted cotton and flame resistant. Skivvydoodles are full cut, roomy, all cotton sleepwear. Manufactured using the highest quality 100% long staple cotton and utilizing the latest printing technology, the colors last wash after wash. Sewn with the highest quality threads, the neckline trim has spandex incorporated for comfort and "shape memory." Children prefer a roomy fit and parents sleep soundly knowing their children are safe in their Skivvydoodles flame resistant baseball pajamas.